What was one of your greatest deals? For this week's League assignment we're writing about our best deal. 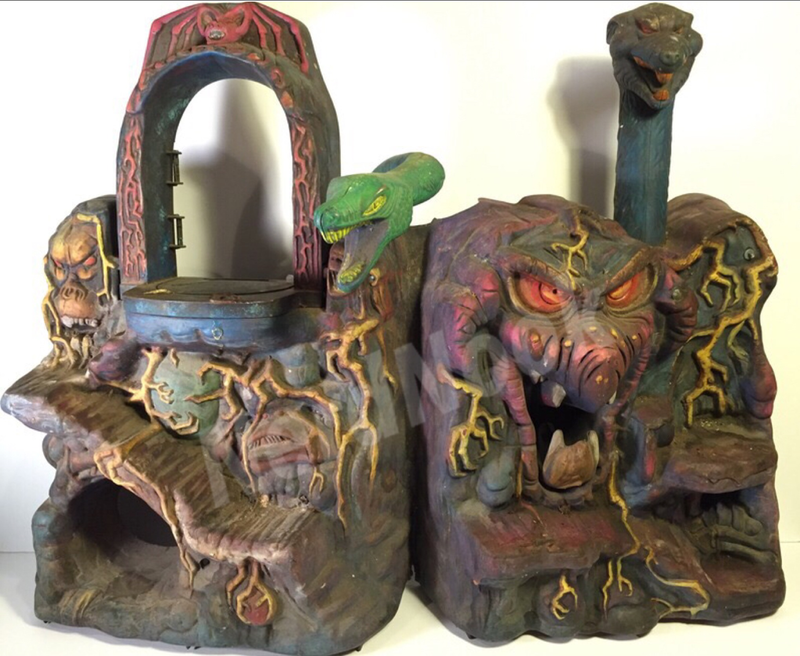 Well for me it has to be my in house, hand painted, Mall Tour Playsets. That photo above is the image taken from the eBay listing that landed these beauties in my collection. To make a long story short I was sitting at a friends going down my saved searches list on eBay when I clicked on my "Castle Grayskull" search. The listings for these sets was there. I checked them out and immediately took advantage of the Buy It Now option of $250. Now I'm by no stretch an expert and had no idea if they were legit or not. I made sense of the impulsive choice for the chance that they'd be legit for that price. I asked one person, who I would consider to be an expert and someone I trust that wouldn't message the seller with higher offers (something that has happened to me in the past), what he thought about the listing. After some digging he came back with a ton of info and photos and told me he had no doubt they were the real deal. This made me excited and nervous at the same time as the chance someone would go and offer more was still a distinct possibility especially given the fact that the completed listing had since be posted in various vintage collecting groups. The seller took a while to ship and even told me he had several offers after the fact that he turned down, but I did eventually get these guys in the mail! Kudos to the seller for his integrity and sticking to the deal! Now for the story on what these things are! 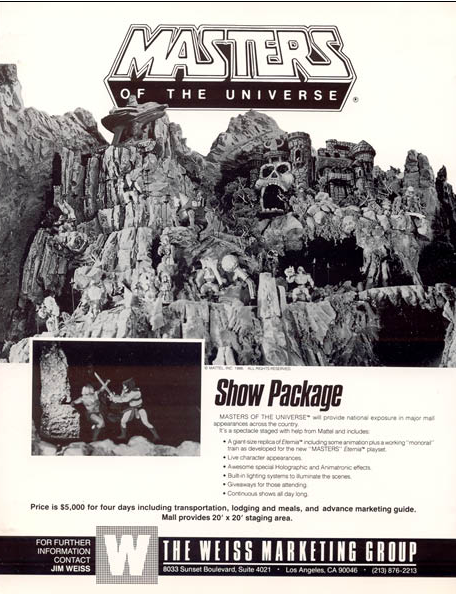 By 1986 "Masters of the Universe" was a bonafide home run for Mattel. There was no end in sight for new characters, sets, and vehicles. Mattel had an idea for a cool, fun, and epically 80s way to unveil their upcoming lineup for their flagship toy line.... the "Masters of the Universe Mall Tour" was born! Basically it was an entire custom done set-up of the world of Eternia, complete with custom/handpainted sets, movable platforms, music, narrations, and even a screen simulated duel between He-Man and Skeletor. 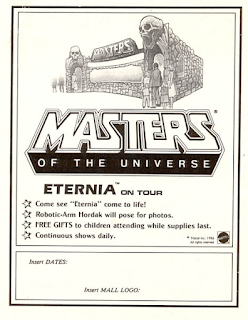 This "tour" traveled the country, setting up in malls where families could walk through and see what they'd undoubtedly be spending their money on in the near future! 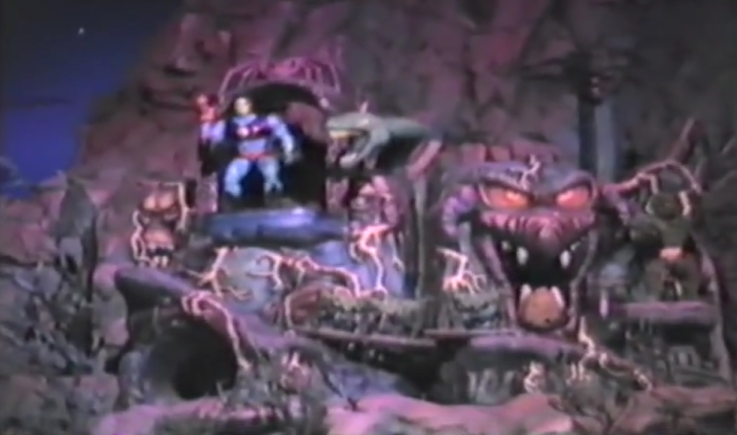 The beauty of all of this is some high tech dad from back in the day had the presence of mind to film the whole thing with his camcorder (which I'm assuming was huge given the year). Watch the video, it's awesome! Here's a few closeups of the sets along with photos of them in use during the show. 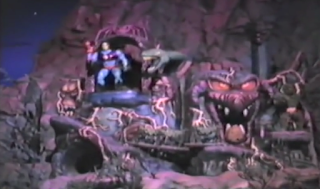 These are the exact sets shown in the above video. This set still has quit a bit of the "terrain" stuck to the bottom. 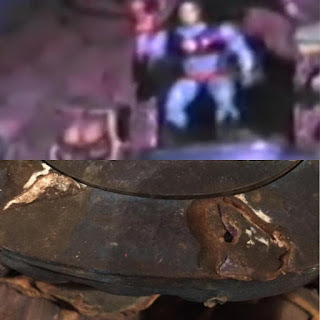 It is also connected using some sort of puddy rather than hinged like the production sets were. In use during the tour. 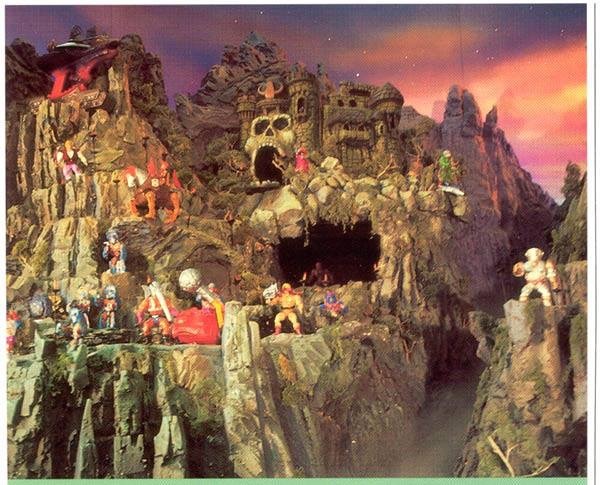 What can you say about the paint job they did on this Snake Mountain?!? 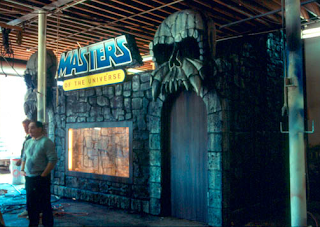 Like the Grayskull, it is glued together. In use during the tour...note the position of Terror Claws Skeletor and Moss Man on the right. A glue print in the shape of Skeletor's boot where he was once stuck to the set for the tour. For a collector this is absolute gold and adds even more to the story these sets tell. So that's it for my "Best Deal" post. 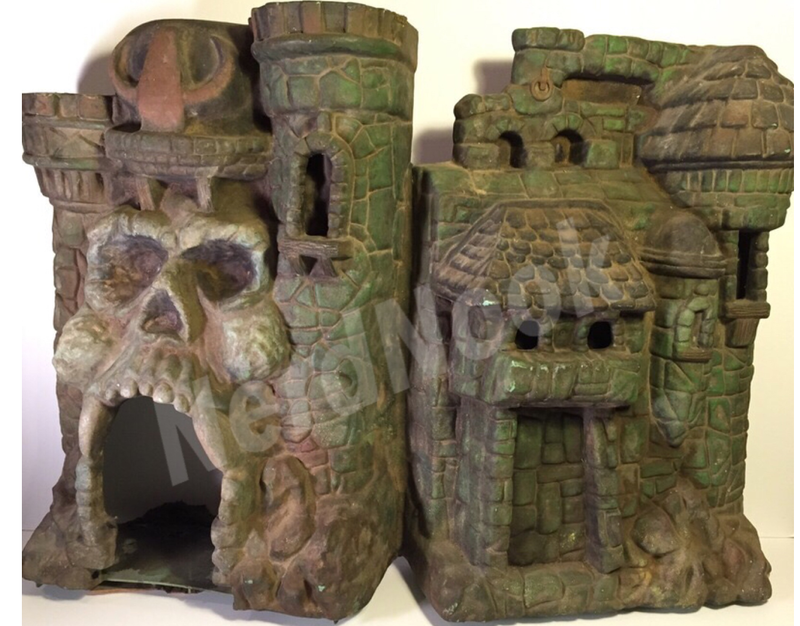 Having grown up "MOTU" I'm thrilled to own this piece of "MOTU" history and at $250 bucks for the pair, I have to figure this was my BEST deal. Complete, loose production sets can sell for close to or sometimes more than 125 bucks a pop. 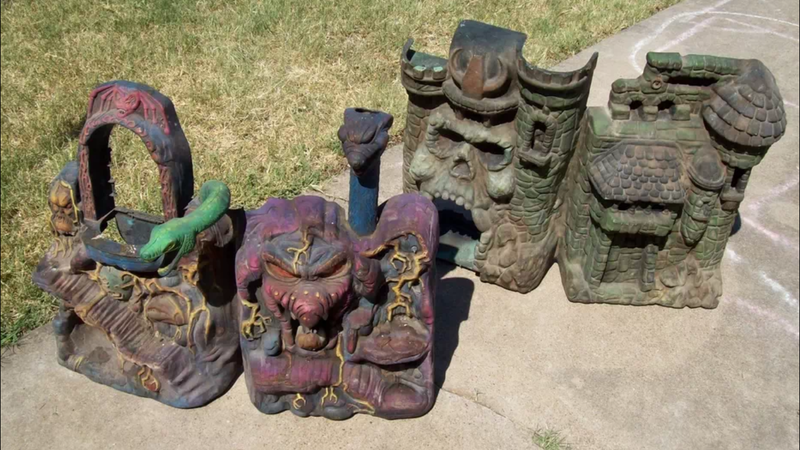 With the artistry, history, and significance these sets possess, they are undoubtedly my BEST DEAL. Here's a few more cool photos related to the tour. This appears to be a flyer used in house by the company that designed and customized the tour. 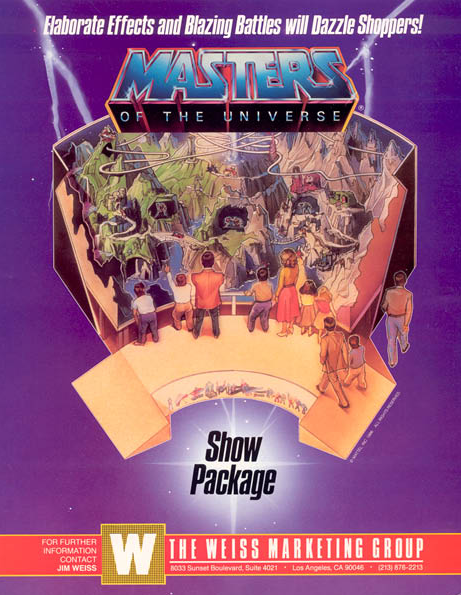 The tour during what looks to still be the pre production stage. So that's it! I hope you enjoyed this post and watched the video I linked. It's a bit of 80s gold especially with the outfits! Be sure to scope the rest of the League's best buy over at Cool and Collected! What an amazing find! These play sets could not have found a better home than the Nerd Nook. Congrats on pulling the trigger and taking the chance. I think that may be the coolest collectible I've ever seen. And what a bargain! Score! Wow, just wow. Great pieces you have there. Pure nostalgia right here. Great find! 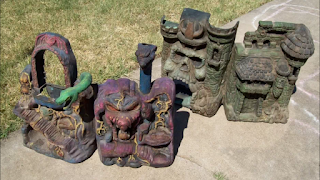 Glad they landed in a home where they would be treasured as opposed to boxed up for future value. Damn!I knew they looked different than the normal releases from the pic.Congrats,man! I know the Pop Culture League has come to an end, but with Brian's blessing we have taken up a weekly challenge over ar RetroRamblings.com called the Retro Revival Blog Challenge.